There will be two non-Premier Division sides in next Saturday’s draw for the quarter finals of the Halifax Parish Cup. Great Horton sprung the shock of yesterday’s second round with a 93-run humbling of division higher Sowerby Bridge while Shelf were eight-wicket home winners against Greetland in an all-Division Two contest. Adam Beesley was Great Horton’s star player. He hit 108 not out and shared a fifth wicket stand of 133 with Chris Brown (52) after Park had been 46 for four. Park made 224 for six and Bridge mustered only 131 in reply with Beesley taking three for four to polish off the visitors. The best match was at Copley where Oliver Thorpe was the star man as the hosts edged a one-wicket win over SBCI in a fluctuating contest. Thorpe, the cup final man of the match in 2014, was unhappy with the way he bowled but still took three wickets as SBCI were limited to what looked a below par 163 for nine. Tom Wood top scored with 62 for the visitors. Thorpe batted throughout Copley’s reply with 58 not out and hit the winning boundary off the second ball of the final over after Daniel Sykes had taken the eighth and ninth wickets with the score on 161 in the penultimate over. Premier Division leaders Jer Lane were given a run for their money by Clayton, before emerging 20 run winners. Imran Mirza top scored with 65 in Lane’s 211 for eight. Ex-Jer player Chris Ramsden led the reply with 77 but home skipper Micky Hustler (five for 38) had the decisive say as Clayton were dismissed for 191. Out-of-sorts Thornton suffered a heavy home defeat at the hands of Booth while South African pair Graham Kinsey (75) and John Currie (four for 25) maintained their good form as Warley romped to a 170-run success over Queensbury. Northowram HT, beaten at home by Sowerby St Peters on Saturday, reversed the form in the away cup tie 24 hours later. Blackley, who moved smoothly past Denholme Clough’s 193 with the help of opener Tom Baxter’s 58 and won by eight wickets, complete the last eight line-up. 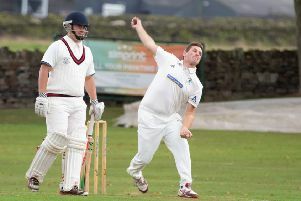 Crossley Shield holders Warley’s tie against Sowerby SP curiously didn’t go ahead and has been rescheduled for June 5. There were some big scores in the second teams’ competition, notably from Mytholmroyd whose top three in the batting order, Tom Russell, Luke Sutcliffe and Zahid Mahmood, scored 339 runs between them in the win over Bridgeholme. There was also a ton from the visitors’ Mohammed Basharat in the same game. Parish Cup, second round: *Great Horton PC 224-6 (A Beesley 108 no, C Brown 52) Sowerby Bridge 131, SBCI 163-9 (T Wood 62) *Copley 165-9 (O Thorpe 58 no), Denholme Clough 193 (G Farid 60, A Mukhtar 53) *Blackley 194-2 (T Baxter 58), *Sowerby SP 226-7 Northowram HT 230-7, Greetland 115-9 *Shelf 119-2, Booth 257-9 *Thornton 128, *Jer Lane 211-8 (I Mirza 65) Clayton 191 (C Ramsden 77l M Hustler 5-38), Warley 285-8 (G Kinsey 75) *Queensbury 115 (J Currie 4-25). Crossley Shield, second round: Old Crossleyans 205-6 (N Awan 47) *Bradshaw 209-2 (M Crowther 72, J Thompson 78 no), *Northowram HT 304-5 Queensbury 113, *Booth 284-5 (S Butterworth 81, I Sharkey 82) Great Horton PC 211 (P Artist 67), Copley 238-8 Triangle 239-3 (G Rodger 119 no, S Charnley 60 no), *Denholme Clough 152 Blackley 154-5, Upper Hopton 165-9 (C Gallagher 70; O Benson 5-17) SBCI 171-3, Warley v Sowerby SP no play (rain) now June 5, Mytholmroyd 379-7 (T Russell 137, L Sutcliffe 99, Z Mahmood 103) Bridgeholme 265 (T Stansfield 72, M Basharat 113).